It said that developers and the investors of the renewable energy sector are hit by what SHPA described as “rather surprising and unprofessional” move by PUCSL when it withdrew the announced tariff for year 2012-2103 through its official web site on 11 September 2012 in the afternoon. Surprisingly, this web announcement came only few hours after the official announcement of tariff for renewable energy for years 2012 and 2013 was published in four national newspapers in all three languages on the morning of the same day. SHPA President Anil Makalanda expressed the members' deep dissatisfaction and condemned the act by PUCSL and urged the immediate reinstatement of a fair and transparent tariff. He further stated that investor confidence to the sector had been affected by this irresponsible and unprofessional behaviour of PUCSL, which would have a long-term devastating impact on to the sector, especially during a time when the Government is promoting foreign investments into the country. According to SHPA, the formal procedure set by the Ministry of Power and Energy and CEB is to announce the tariff payable for renewable energy for the specific year before the end of previous year. In this respect the tariff for year 2012 should have been finalised and published on or before 31 December 2011. The tariff announcement for 2012 has already been delayed by nine months. The developers who had signed Standard Power Purchase Agreements with CEB this year have no option but to wait until the tariff is announced to commence construction of the plants as banks require the tariff to be announced before dispatching any loans. The developers have complained to the Small Hydro Power Association that their licenses to operate renewable energy plants where Power Purchase Agreements have been signed are expiring while they have to wait indefinitely without commencing construction work due to non-announcement of the tariff. As per the 'Mahinda Chinthana - Future Vision' statement on 'New Sri Lanka,' the clear targets had been set to achieve 20% of the total supply of energy through renewable forms of energy by 2020. The present level of supply is only at 7% and the industry took 17 full years from 1996 to 2012 to reach this level. The developers have explored and found renewable energy generating plants with a combined capacity of 700 MW during the last 17 years since the inception of the industry in 1996. Power Purchase Agreements have been signed for a combined capacity of 525MW with a total number of 212 plants countrywide during the last 17 years. However the total of operating plants as at August 2012 is 275 MW of combined capacity with 116 individual plants. This means that another 96 plants with combined capacity 250MW are already to be developed but not progressing due to act or inaction of the above nature by Government institutions. The delay of nine months in announcing the tariff will have very negative impacts on the development of the sector in the forthcoming years. The 20% set target by President Rajapaksa will not be achieved due to the unprofessional conduct of such institutions. Small hydro, biomass and wind power are the three operating forms of nonconventional renewable energy available in Sri Lanka. According to the research done by USAID and the World Bank during the post 2000 period, the total potential of small hydro power generation (less than 10MW plants) is assessed at 350-400MW and harnessable wind potential of 800MW. The leader of the sector being small hydro power presently has a combined capacity of 210MW in 87 individual plants. The Small Hydro Power Association is the official collective voice of the industry. Wind power, though relatively new, has progressed rapidly during the last three years, with the main reason being an investor friendly tariff published in year 2009-2010. 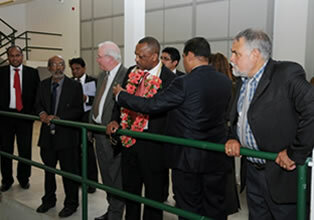 The sector presently has 50MW of operating plants in the Puttalam area. Another 40MW plant is being developed where Power Purchase Agreements have already been signed. Sector analysis shows that the wind season, which falls during less rainfall months of July-August period, has fed in much-needed energy to the national grid at its fullest potential due to stronger winds prevailing during this period, thus replacing huge prices such as Rs. 40-50 per unit of electricity paid to the thermal energy producers. The debut on tariff payable for nonconventional renewable energy had been decided by the CEB before 2007, based on its avoided cost per unit of thermal plants. The above price does not reflect the real benefit to the country as a whole due to the positive contributions of renewable energy such as reducing the trade deficit by replacing oil imports, non-emission of green house gasses, income to the local community due to increased jobs, and through purchasing of raw material from village community for bio mass energy, etc. The Ministry of Power and Energy in 2007, realising this fact, therefore introduced a more transparent and equitable tariff setting mechanism where the price paid for each unit of renewable energy produced to be based on the cost to the developer plus a reasonable return to the investor. This new mechanism at the introduction created confusion due to misrepresentation for certain critical input parameters such as capital cost, plant factor, bank interest rates, etc. However, the continuous dialogue which prevailed during the last few years paved way to develop a more reliable model acceptable to both developers and officials of CEB and Ministry of Power and Energy and PUCSL. The tariff announced by the Ministry of Power and Energy and CEB in 2010 had an impact on the positive growth of the industry. The total number of 37 hydro and wind projects with a combined capacity of 80MW was developed and power purchase agreements were signed during that year. However, the downward trend to the tariff in 2011 made the investments disappear and only 21 hydro and wind projects with a combined capacity of 44 MW signed Power Purchase Agreements. The impact of this negative trend could only be seen in few years time when no renewable plants are being added to the system, thus making the national plan of the President deviate drastically from the set target levels. According to Small Hydro Power Association analysis and related industry statics, the set national target through the 'Mahinda Chinthana' for 20% contraction to national energy demand through renewable energy cannot be achieved by 2020 and the maximum target achieved will be 12-15% at maximum optimistic levels. Last year's generation statistics reveal that Renewable Energy Projects have managed to supply much-needed indigenous energy to the country when most CEB hydro reservoirs have reached rock-bottom water levels. The total power generated from renewable energy (mini hydro, wind, biomass, solar) amount to 706 million units in calendar year 2011. The Small Hydro Power Development Association appreciates the role played by the CEB amidst its financial difficulties by helping the industry by absorbing renewable energy to the CEB system. 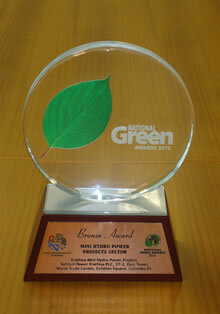 During 2011, the contribution from Non Conventional Renewable Energy amounted to 7% of national demand. CEB honoured the payments and payment milestones as per the agreements and contributed to build up investor confidence - banks had no hesitation in providing loans to the industry, stated the President of the Small Hydro Power Association. During 2011, the average tariff paid by CEB for renewable energy amounted to Rs. 12 per unit of electricity. If this was not available, CEB would have been reluctantly compelled to purchase the said 706 million units of electricity from high cost thermal plants. According to CEB and Power and Energy Ministry sources, the average cost of thermal energy to CEB stands at Rs. 22 per unit of electricity. This include the Government subsidy too, which is provided throughout in order to keep the electricity cost down. In a snapshot, the financial benefit to CEB by absorbing 706 million units of renewable energy amounts to Rs. 7,060 million, and if the Government subsidy for fuel prices too were considered, the saving to the nation is Rs. 140,000 million. The actual thermal energy cost to the country is around Rs. 32 per unit of electricity today. On environmental aspects, renewable energy projects provide green and clean energy - they do not emit Co2 to the environment; the saving of carbon emissions last year equalled 500 tons of carbon. Anil Makalanda, one of the pioneering hydropower developers in the country, stated that the need of the hour is that the Government and its officials foresee a broader spectrum and realise the need for rapid development of the sector and clear red tape and promote the industry, which can have a direct impact on the trade deficit. All statistics and information obtained from www.ceb.lk.